I found a basket on my doorstep tonight, and inside was a new version of Collegiate Sam! This one is the version issued on Columbia by (the real) Eddie Walters, who I suspect is the vocalist on my mystery version. NYC, 6 September 1929: ? Mike Mosiello, trumpet; Andy Sannella. clarinet; ? Ben Selvin, violin; ? Rube Bloom, piano. Okay...here's where I stick my neck out (drum roll, please! )...I think they're the same singer. Sure, the Columbia is taken a lot slower, but the vocal quirks are very much the same...just a little more frantic on my record. Aaaaaah! What do you think??? Oh, the experts at 78-L tell me the composers on our song are Davis and Coots...not Tom Stacks, who's listed in those highly unreliable song lyrics sites...the same sites that have someone spraying flies with cans of Blitz. And now for something completely different...another excerpt from the Mirth Quakers radio show of 1930...vocalist is Jerry Macy again. But who's in the band? Adrian Rollini? I'll leave that question to the discographers out there. XE-33603 (excerpt) - Bananas (from Mirth Quakers, Show C, part 3). Jerry Macy, vocal; Studio orchestra. More Addenda! 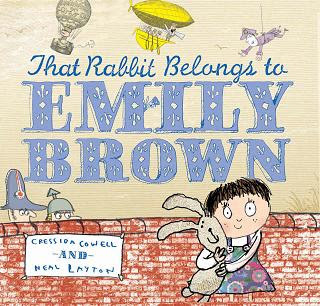 And who is Emily Brown, anyway? 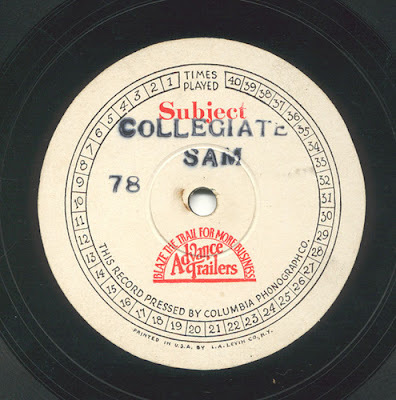 The last record I posted, Collegiate Sam, features an unknown vocalist that I said reminded me somewhat of Eddie Walters. Here's Walters, sitting in with the Charleston Chasers...a pickup band featuring (for this session, anyway) Phil Napoleon Tommy Dorsey, and Benny Goodman. NYC, 28 May 1930: Phil Napoleon, trumpet; Tommy Dorsey, trombone; Benny Goodman, clarinet; Arthur Schutt, piano; Ward Lay, bass; Stan King, drums; Eddie Walters, vocal. I've compared the vocalists on both records...they could be the same, but the differences in miking the singers throw me off a bit. So...Emily Brown got around a bit...she's the topic of the next record too! NYC, 2 July 1935: Roy Eldridge, trumpet; Benny Goodman, clarinet; Ben Webster, tenor sax; Teddy Wilson, piano; John Trueheart, guitar; John Kirby, bass; Cozy Cole, drums; Billie Holiday, vocal. According to the lyrics of a song that keeps popping up at this site, you should never swat a fly. However, shooin' them is apparently permissable. Memphis 15 May 1930, small band (exact personnel uncertain) featuring Kay Austin, vocal. A terrific side...sadly the only recorded vocal by Ms. Austin. Here's another mystery for y'all...who is this singer? It might remind one of Eddie Cantor, but I'm reminded more of Eddie Walters, a (more-or-less) forgotten ukulele-toting singer who pops up from time to time on dance band records of the early 1930s. I'll probably have to post a Walters side soon to show what he sounded like. In any case, this record remains a mystery...it's a 12" one-sided piece, pressed by Columbia (mx ST 1416) for some client...a red logo for "Advance Trailers" is present, but is that the client's name? It'd be like getting a Model "A" with no mention of Ford on it...just something that said "Automobiles." I can't find any film called Collegiate Sam either, so it's doubtful that this is an advance trailer (or at least its soundtrack) to a film of that title... Perhaps this was played between features in a theatre. It's anybody's guess. In any case, it's fairly hot...with the xylophonist in hyper-drive throughout the record. An accordion is also prominent. Add the trumpet and alto sax...I wonder if this is by The Usual Suspects from the Grey Gull studios (Mike Mosiello, trumpet; Andy Sannella, reeds & steel guitar; Charles Magnante, accordion; George Hamilton Green, xylophone). It could be, but I'm not too sure...the "cordeen" sounds to me more like Cornell Smelser than Magnante. If this was recorded like a typical Grey Gull side (shrill and blasty), I'd have a better idea who it is. The bass sax gallumphing in the background is fun, but it's another fly in the ointment...its presence throws me off the Gull track completely. And the singer (whoever he is) mentions a Whoopee Hat!! 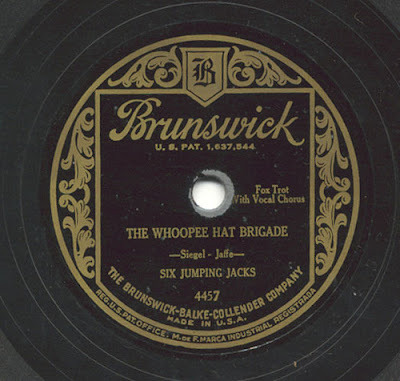 Here's another Whoopee Hat song, from July 1929...featuring Tom Stacks singing with Harry Reser's Six Jumping Jacks. 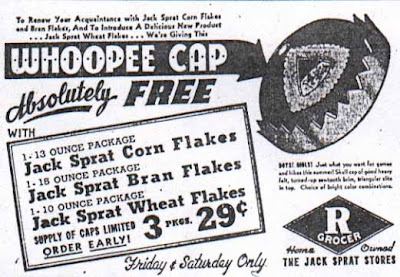 So...what is a Whoopee Hat, anyway? And, getting back to Cantor, he made Whoopee in more ways than one. But I still don't think my record is of him. Who is it? 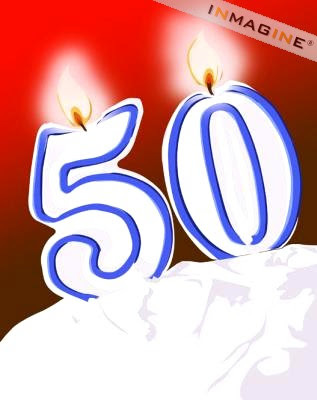 Another friend turns fifty this weekend...I asked her what music she'd like me to post. 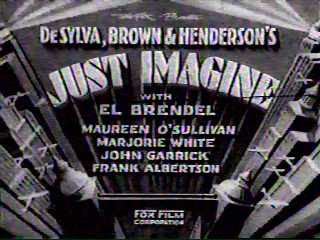 She wanted good 1930s material by Ray Noble (with Al Bowlly, of course) and Benny Goodman. And the Goodman material is taken from a couple of broadcasts from the Madhattan Room in the last couple of months of 1937, just before they appeared at Carnegie Hall. The instrumentals pretty much speak (er, roar) for themselves. ...for some reason (one that still remains unclear 70 years later), the record of this song was yanked by Victor before it was officially issued, although a box or two (25 copies each) apparently did sneak out. For a little surprise, and an interesting contrast, I sign off with two versions of Oh Baby. The first is by the All Star Orchestra, a Nat Shilkret studio band, this time containing Jimmy McPartland, Glenn Miller, and a teenaged Goodman. The other, from the 1946 BG band, features solos by Mel Powell, Lou McGarrity, and Goodman, who also, er, "sings." The arrangement, spread over two sides of a 12" 78, is interesting, pitting his sextet against the whole band for some nice call-and-response action. Enjoy. 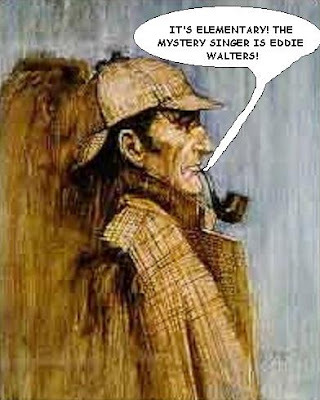 My friend Daniel from the She Sings Jazz And More blog kindly sent me the Andy Kirk version of I'se a-Muggin' that I was missing...it's a good jazz version, and it's missing that whole Musical Numbers Game that drove me buggy when I did the original Muggin' post. Oh...I have a few interesting posts in the works...one on records connected somehow with Hitchcock movies, and one on (more or less) forgotten line dances. Stay tuned!